The blog may have come to a standstill, but life sure has not. I don’t even know where to begin. It has been nearly nine months since the last post… that sounds like a good place to start! 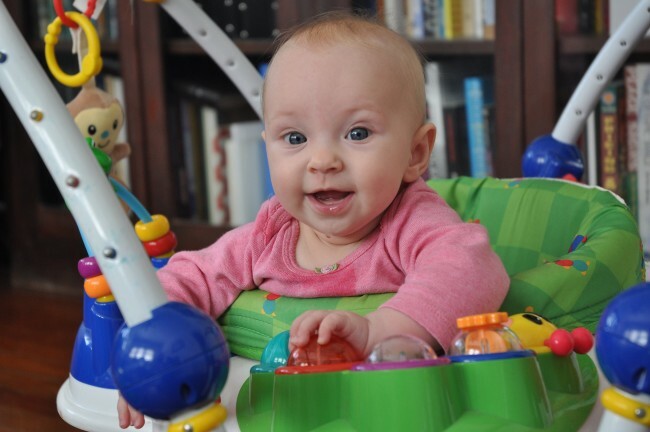 Speaking of things that take nine months – we have a baby! Last January we found out we were expecting a wee one. 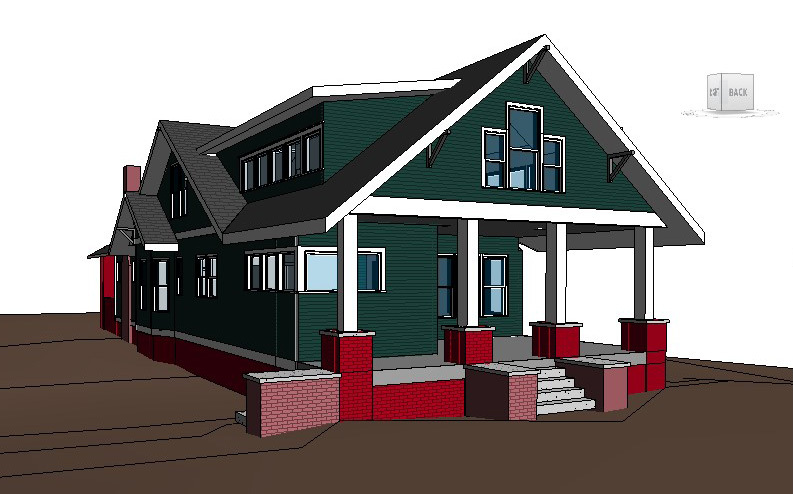 This was super exciting news, but we all of a sudden felt the pressure of many incomplete house projects. We went into overdrive trying to get things knocked out before the baby arrived. This involved really simple projects, like putting a hook on the porch to hang up the wind chimes (five minutes), to more complex projects, like trying to finish paint stripping the dining room and living room. The latter project forced Steffi to leave the house or go work outside for the day. Paint stripping and pregnant women do not mix. It felt like a pretty productive time, but the list of remaining projects is still very long. Stripping the bookcase next to the fireplace. 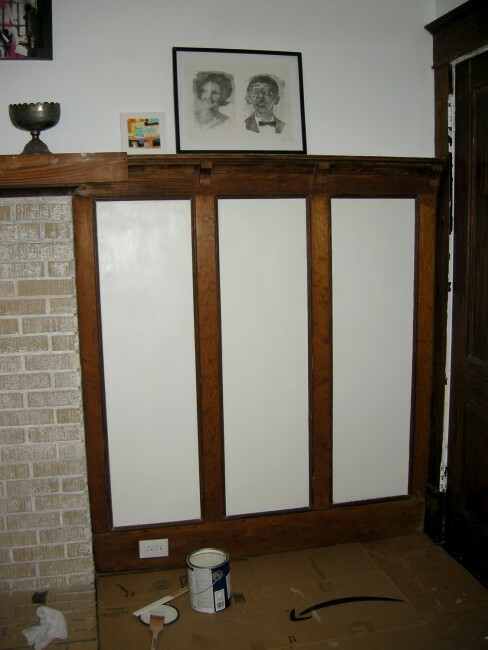 Lots of nooks and crannies where paint can hide. 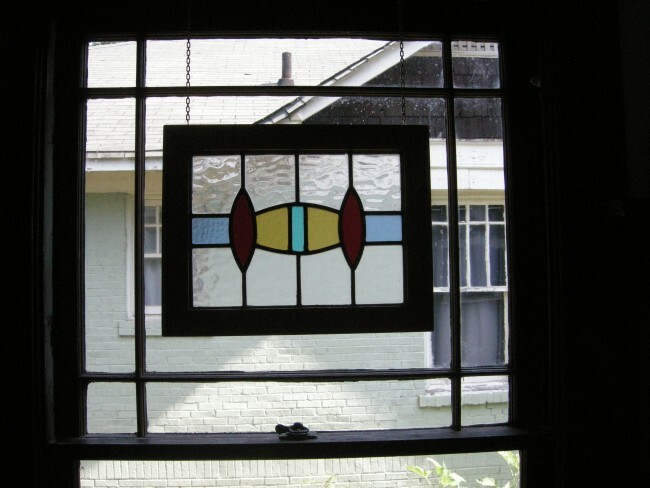 We bought this stained glass years ago and planned to hang it in front of this window. It took a while to find the right chain, but we finally got it done! 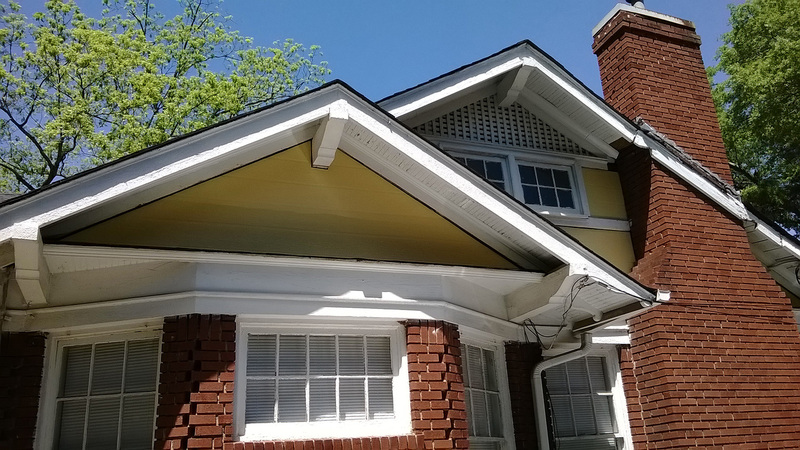 I also went on a multi-day sash lift paint stripping marathon. They are as good as new when I got rid of the years of paint, and it isn’t that difficult – just boil the hardware in a pot of water. And the door hinges got stripped and cleaned up when Steffi requested I oil a squeaky hinge so it wouldn’t wake the baby. This is an ongoing project. 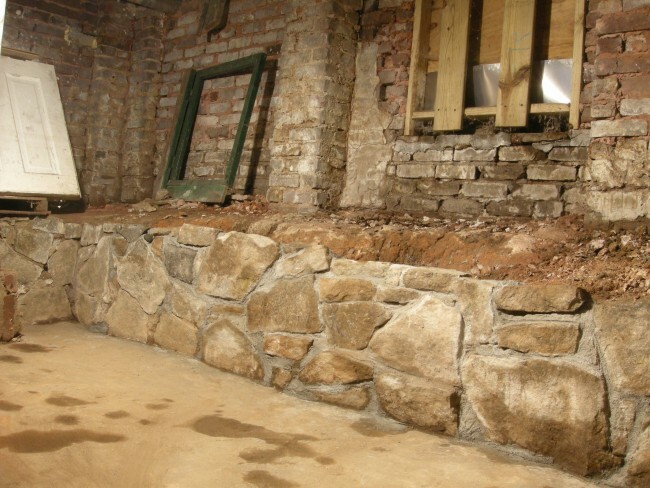 I’ve been rebuilding the old granite wall in the basement to hopefully make it more water tight. And then there were some unplanned projects. 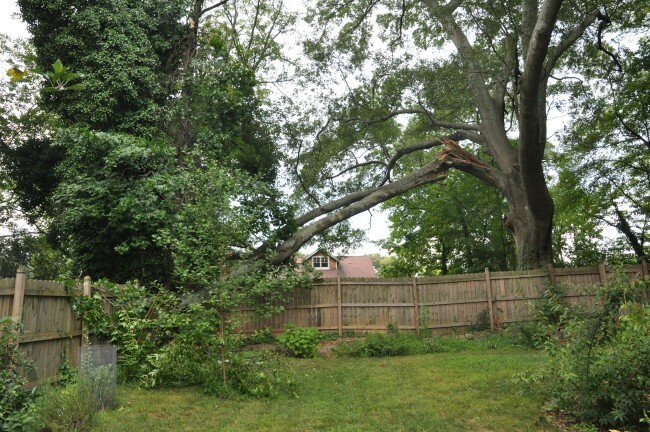 Like, that time the giant limb on the massive oak tree came crashing down. This giant limb came crashing down in July. We heard a loud crack, and looked out the window and noticed this branch was wedged on an adjacent tree. Before the tree crew could arrive the other tree gave (in the top left of the photo) and it all came crashing down. Last, but not least – our new addition! There’s so much news to share this spring, but first the big news…. we’re expecting a new addition in September! No, not a new addition to the house – a new addition to our family!! The addition to the house has to wait for now, but needless to say we need to wrap up some existing house projects before the wee one arrives, so we’ve been busy. The yard is looking amazing. Everything is growing in nicely. We only had to do the annual spring cleaning and trimming, but no heavy planting or landscaping this year. 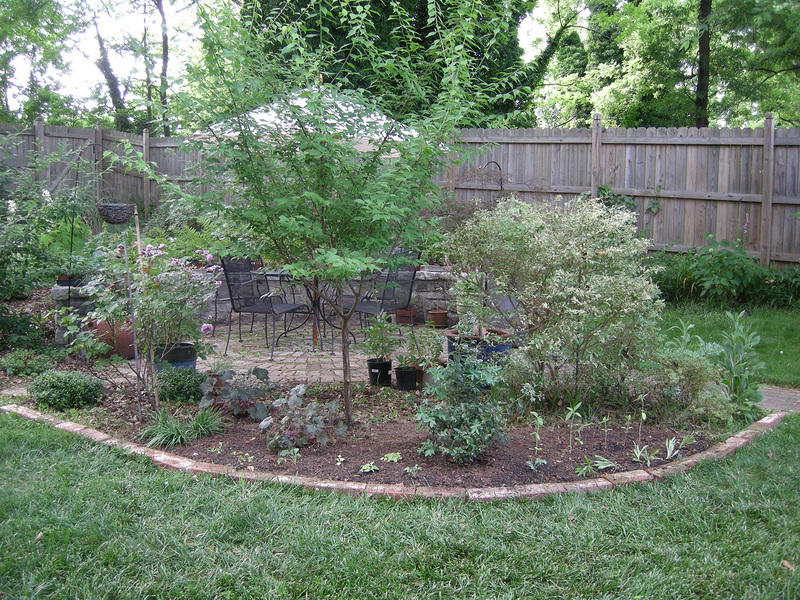 We just added a new blueberry bush (we have six now!) and a few small perennials and annuals in an expanded bed by the patio. 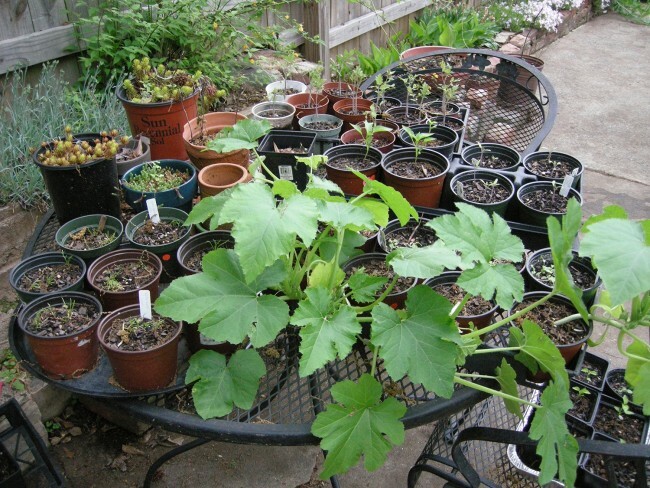 And, as we do every year, we have grown a bunch of veggies and annuals from seeds. The expanded bed by the patio with the new “Sunshine Blue” blueberry bush, some sunflowers, cornflowers, Canterbury bells, kale and coral bells. 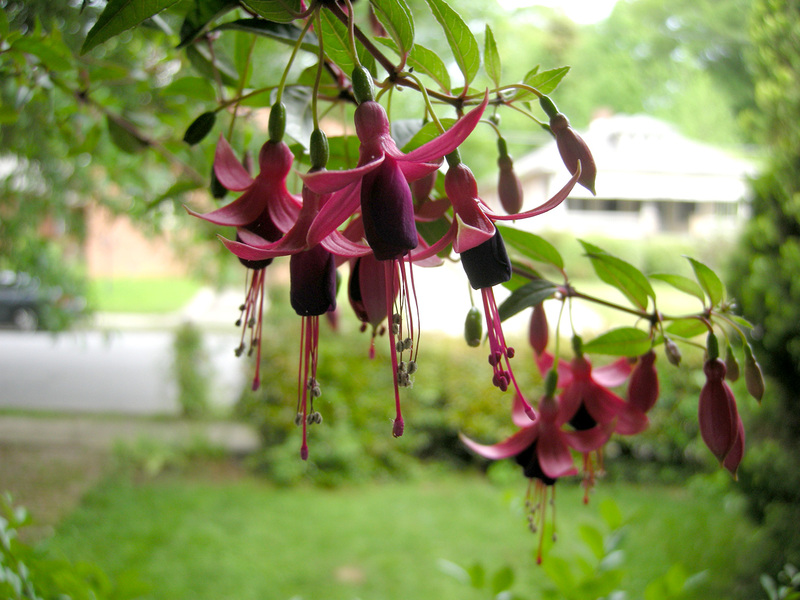 We got these beautiful Fuchsia plants from Gardenhood for our front porch. They remind us of Europe. Some of our veggies waiting to find their homes in our gardens and our neighbors’ gardens. I’ve continued stripping some paint off the wood work in the living room. Steffi’s stripping capacity is non-existent at this point, so I have to find times when she’s away from the house or in the garden to get out the heat gun and chemicals. (When you’re expecting you really make sure to read those labels carefully!) The weather also has to cooperate to make sure all the windows are open and the house is well ventilated. We’re inching closer to being in a semi-finished state before the baby arrives. Cross your fingers for us! Steffi actually let me put some paint on the walls in the dining room. She had been holding out until all the paint stripping was done, so this is a step closer. Painting in the dining room. 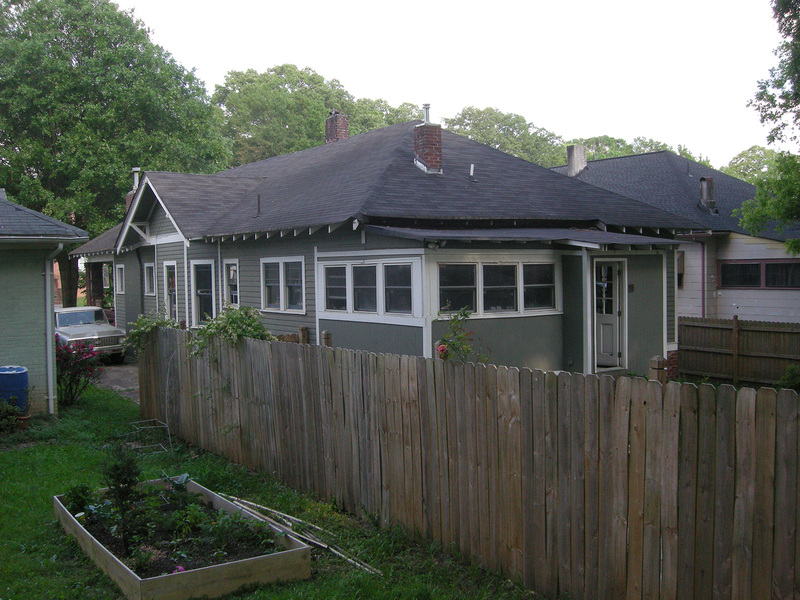 Yes, we just painted a slightly tinted white over the old dirty flat white paint. It makes a difference when you see it in person. Some other SUPER AMAZING news to share: I found a blog with pictures of our house in the 1960s! We’ve been hoping to find old photos of our home and street, so this was incredibly exciting for us. We’ve connected with Cynthia, the author of the blog, and are planning to meet to hear more about her family and their time living in our home. We can’t wait!!! We have now made contact with family members from all three families that lived in our house before us. I have to give a special mention to Marlene and Ted for helping us make the connection with Cynthia. Marlene and Ted grew up in the neighborhood in the 40s, 50s, and 60s. They came over to talk to Steffi and I about their memories, and Ted said we lived in Anne Nunn’s house. We knew the name of Anne’s mother because of the house’s deeds, so a Google search of their names together revealed Cynthia’s blog. Stay to tuned for the next update. I’m sure it will be an exciting one! 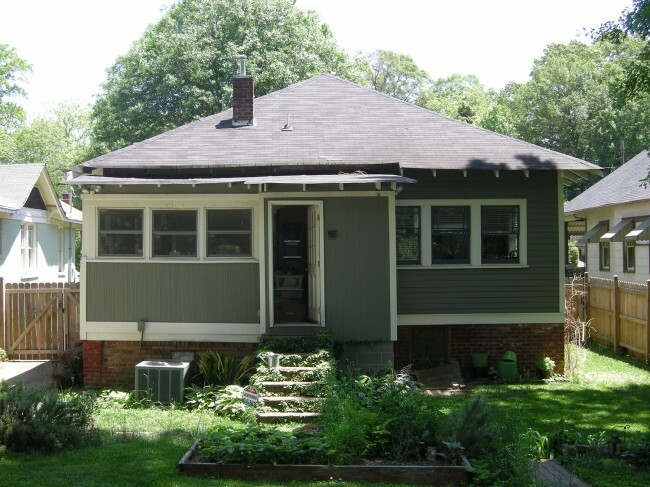 Posted in Gardening, Our Bungalow, Photos, Westview Bungalow | Comments Off on Spring is Here! The one up side to winter is that it forces us to stay inside, which means we focus our energy on the interior of the house. We’re so incredibly close to finishing soo many projects, all of which involve removing paints from various surfaces. And there are so many ways to remove paint. You can use a heat gun, chemical gels (of various colors), special milk paint remover, and Steffi’s favorite: dental picks. Here are a few things we’ve been working on and hope to finish before the warm weather beckons us outside to the garden. 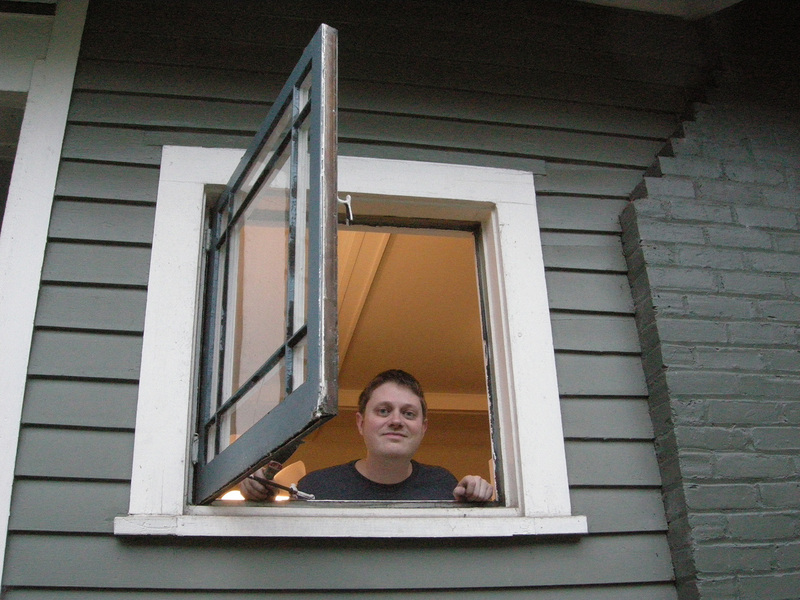 This window probably hadn’t been opened in many, many years. A little work with the heat gun to loosen it up around the edges, followed by some pushing and pulling, and the window was open! Additionally, the hardware had been covered with many layers of paint, but once it was all cleaned off it worked perfectly. 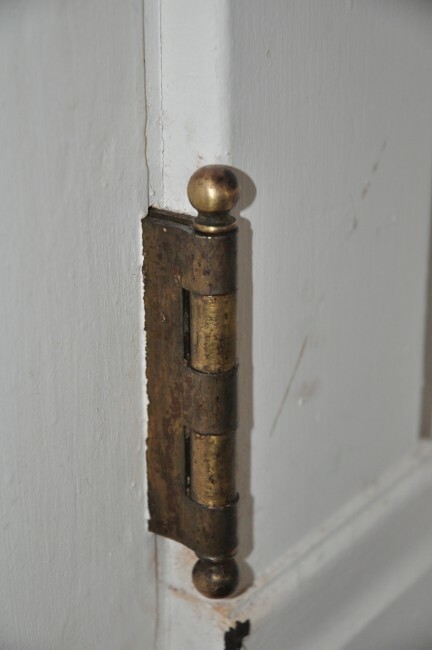 Seriously, who paints the hardware? Let there be fresh air! 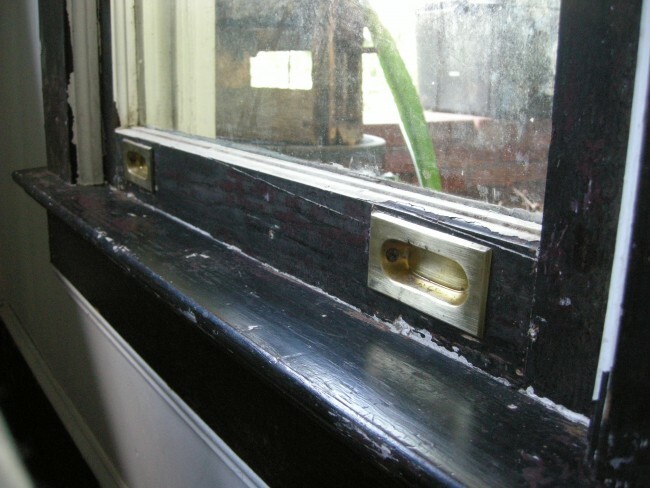 One of the cooler finds buried under all those layers of paint on the window was this old brass storm window tack. As far as we can tell there would have been screens for the windows on each side of the fireplace. The numbers would have allowed you to match the screen to the correct window. The brass storm window number tack hiding under all that paint. 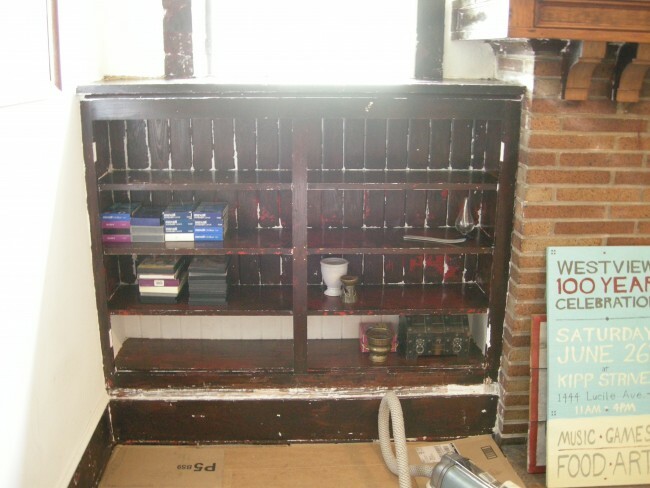 Removing milk paint with milk paint remover. 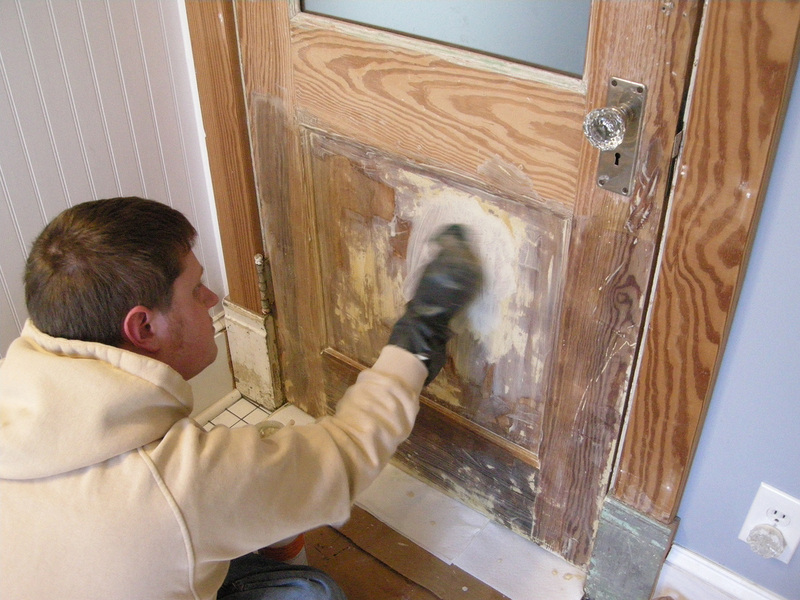 More milk paint removal taking place on the back of the bathroom door. The other side of this door has been stained many years ago, but it didn’t have milk paint. 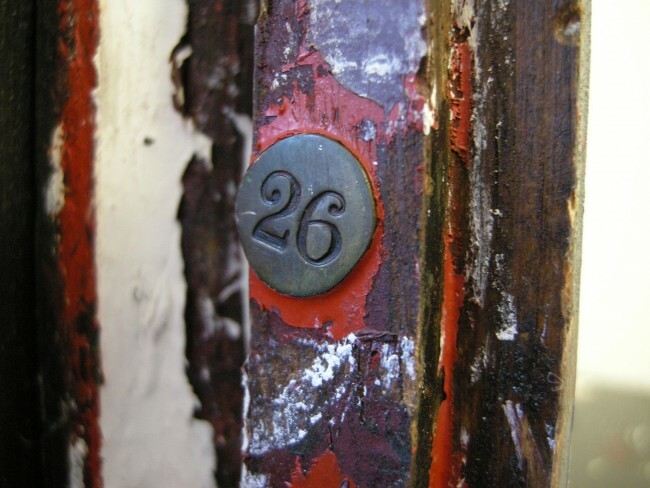 Okay, so you’re probably asking, if removing milk paint is really so easy why has it taken you so long? Well you should stop asking. We’ll finish all these projects eventually. The paint stripping in the dining room is hopefully nearing completion. We’ve only been working on it off and on for eight years. The good news is we purchased the stain for the wood and the paint for the walls, so hopefully there will be an update soon dedicated exclusively to that project. In the meantime, while Steffi works on the tiny details in there with dental picks, I’ve moved on to the living room. 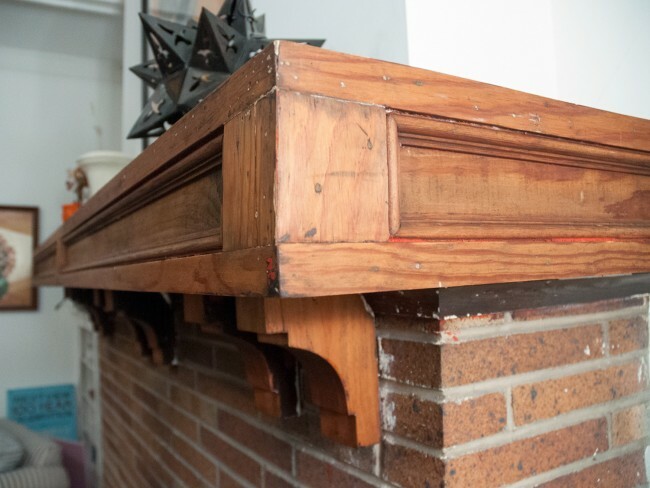 Check out the amazing fireplace mantel! Look at that beautiful wood that was hiding under all those layers of paint. Late March is one of our favorite times of the year! 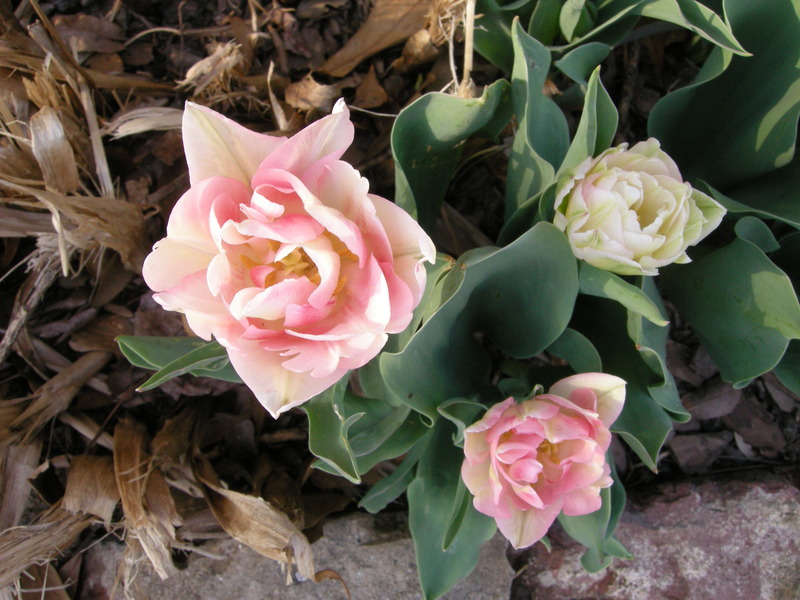 The temperatures start rising, the plants start emerging from their slumber, and we can look back at what the cold temperatures helped us accomplish inside the house. When it’s warm outside we have a difficult time staying indoors. 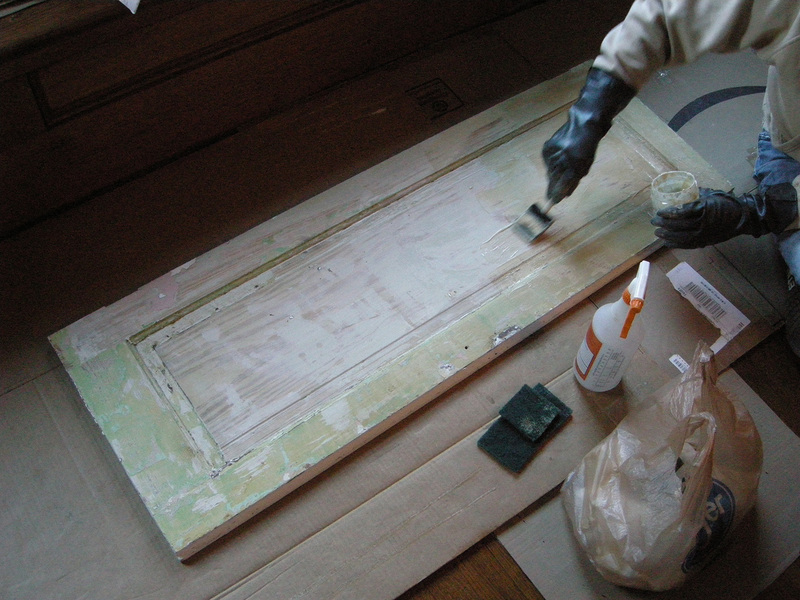 So back to one of our favorite past times… you guessed it, we’ve been paint stripping in the dining room again. I’m happy to say we’re getting really close. It’s only been seven years! The day Steffi lets me paint the walls will be a very big deal (she says the paint stripping has to be done first so we don’t mess up the paint). I do about 98% of the work with the heat gun and paint scraper, but Steffi’s 2% takes 98% of the time. 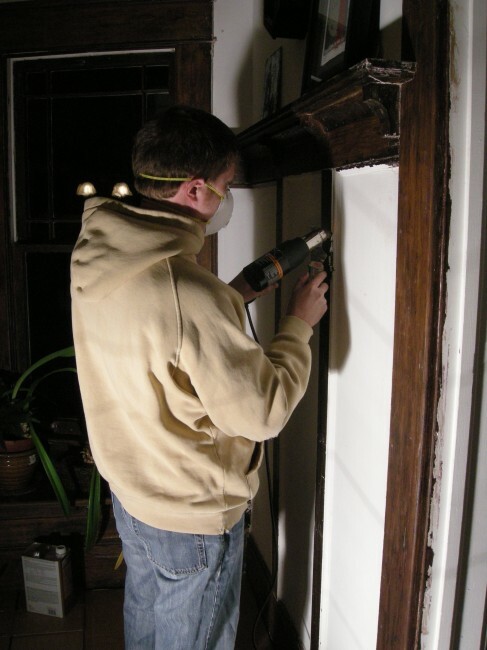 Paint stripping with the heat gun in the dining room. Lots of paint removed in little time. Look really closely at this next photo. Yes, that is a dental pick in her right hand. Now do you understand why it takes so long? How else are you going to get in those little cracks? The outside is beckoning, so we better hurry up. Spring is coming! 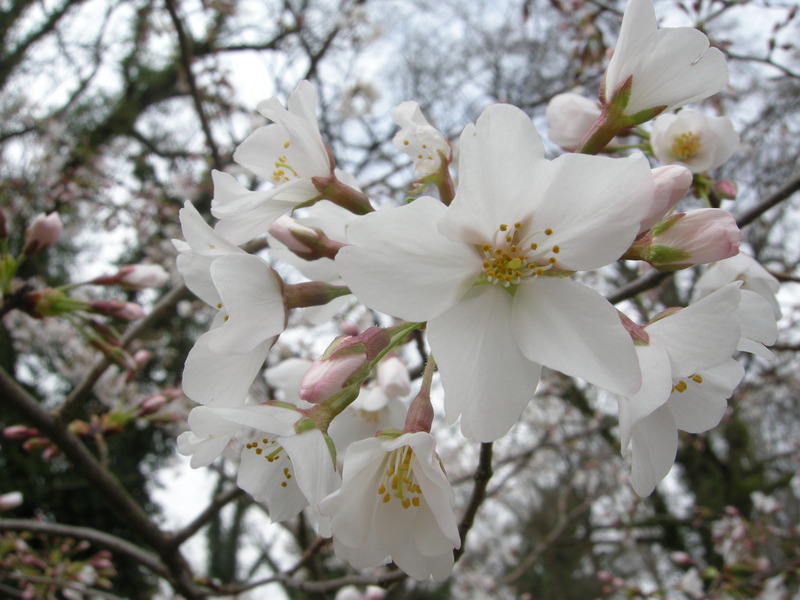 The Yoshino Cherry tree is in full bloom. Cross your fingers for our dining room!